Drop me off at the next reef. 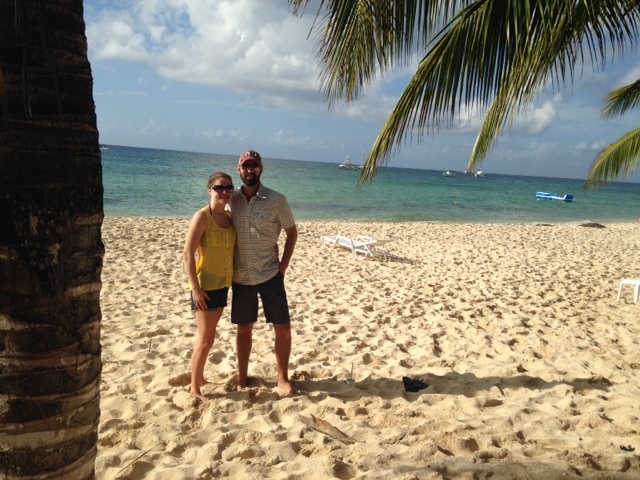 Just like a dream, we woke up in Cozumel on a Saturday morning. Can we make this a regular thing, please? Wake up in middle of ocean. Get off boat. Start day on Mexican beach. I’ll take two. A short cab ride from the port, and we were lying on the beach at Nachi Cocom, a private club where I had reserved two spots for Mr. W’s birthday. Snorkeling was on the agenda, so it wasn’t long before we hopped on a glass-bottom boat for a choppy 15-minute ride to Colombia Shallows, a popular reef made up of large coral heads. Miles and miles of turquoise water surrounded us when seasickness struck, but there was no turning back. I crossed my fingers. We donned our gear and hopped overboard. Soon enough, serenity found me — wide-eyed and eager to acclimate. The underwater adventure turned out to be a long slow drift with hardly a current. Perfection. Our guide motioned toward schools of snapper and all sizes of sponges. Underwater, he held up a starfish bigger than his face. He poked at an agitated barracuda. And he pulled up a sea spider with more legs than I could count, asking me in Spanish if I wanted to hold it. ‘Preciate the offer, but I’m gonna pass on that one, Señor Joseph. I’ll stick to stalking the angel fish. On a second stop at the nearby Palancar Reef, a stingray lay solo at the bottom of the sea. We watched him for a while. Rough life, man. Next chance I get, I’m writing him a fan letter. I have a new appreciation for toe rings and animal prints after a recent cruise to Cozumel with Mr. Wonderful. Many of our shipmates looked suspiciously like the people of Walmart, but I will give credit where creativity is concerned. Kudos to the groups of cruisers sporting matching shirts bearing phrases like, “Get Ship Faced” and “Titanic Swim Team.” What can I say? I I have a soft spot for XXL puns. Well done. All the while, I was crossing my fingers I wouldn’t end up with a “SURVIVOR: Carnival Edition” tee as a souvenir after hearing about the infamous “poop cruise” last fall. If you remember, that’s when a fire knocked out THIS VERY SHIP’s power, leaving 4,000 passengers and crew stranded for 4 days without sufficient food, water or toilets. I don’t think I have to explain the nickname. 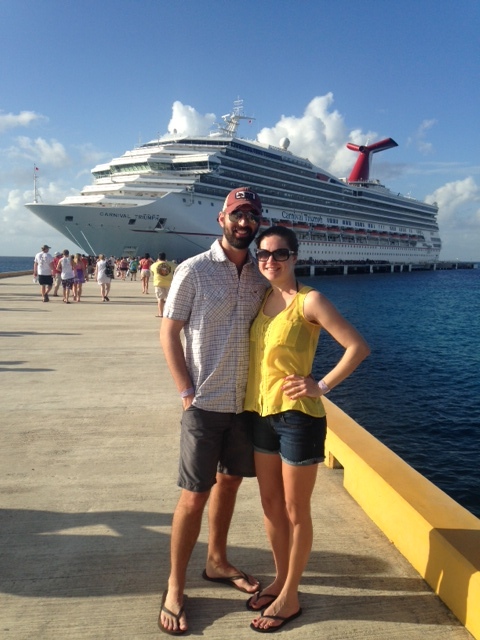 Thankfully during our stay, all went swimmingly aboard the Triumph — named appropriately. Full disclosure: I may have boarded the ship with my own travel-sized bottle of Lysol. I may have worn flip flops in the shower. And I most certainly had the hand sanitizer on rotation. So there you have it. Confessions of a germaphobe. Revealed. Minus a little motion-induced vertigo, our sunny sail days were pretty solid. Impressive cleanliness, lot of activities, great food, good tunes, and, of course, perfect poolside company. Actually, seasick sweetheart seemed perfectly content in his lounge chair watching me host a dance party of one on the lido deck. Who knew that Pitbull had such an effect on me? 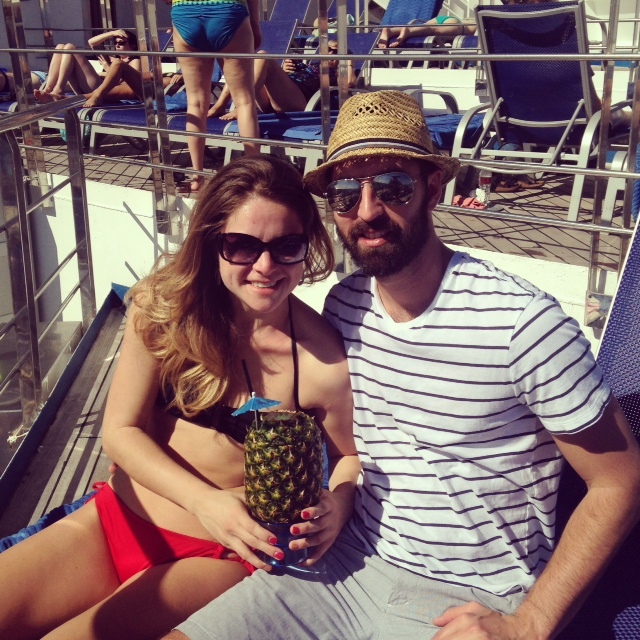 Or was it the lovely libation presented to me in a pineapple? Warning: Novelty drinks may cause illusions of grandeur on the dance floor — as evidenced by the rum cocktail served up inside a disco ball the night before. All aboard!